In standart-colours: white, balck, grey, blue, red. The wall showcase is lockable and easy to mount. Our aluminium wall showcases are extremly solid and can be send in one piece. 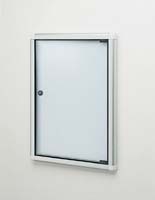 The doors are made of ESG-glass (safety glass). The back board is made of metal.